Cupcakes 'n Daisies: First of Many . . . . Here's Block One of my Memories of Provence block of the month by Monique Dillard of Open Gate Quilts. The blocks are 12 inch blocks. A nice size for the amount of pieces in each block. I had forgotten how much I enjoyed a nice block of the month. I think I like the challenge of making a new block as much as I enjoy the sense of accomplishment when it's finished. So only 11 more focus blocks and 20 more setting blocks to go. I can hardly wait for block 2. The last time I blogged about this project I received a few inquiries about the possibility of signing up. 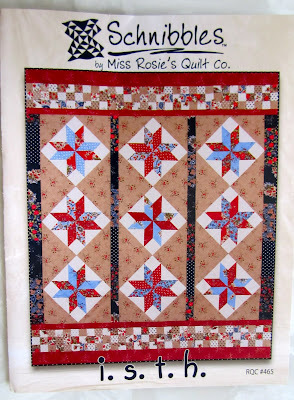 There are several stores online offering this block of the month, I'm using Craft Town Fabrics from Pekin, Indiana. I called the shop on Friday and they still have some spaces available if you would like to join in the fun. 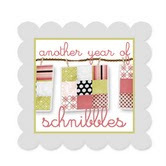 The next pattern for Sherri and Sinta's "Another Year of Schnibbles" is i.s.t.h. I like this pattern, I like stars and I like checkerboards. But I went through my "stash", which really isn't much of a stash, and came up empty handed, none of my fabric really shouted, "pick me, pick me". 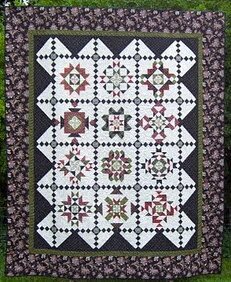 The only fabric that I have that's not a kit that's available for this pattern is some Bliss, a hodgepodge of civil war reproduction fabric, some batiks, some Kansas Troubles, some Fig Tree and some French General....that's it. 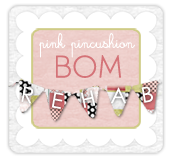 Maybe when I see some finished projects pop up in blogland I'll get inspired. Right now all I have is the pattern. I got some interesting feedback regarding my February 29th day. Some folks mentioned that they work and can't stay home in their pajamas with no makeup eating cupcakes and sewing all day, that's a pity. But someone mentioned that an extra day means 24 hours, and why not take an hour or two throughout the year, I think that's a great idea, maybe that would work better for you. If I'm sleeping for 7 hours of my extra day, maybe I need to stretch it out for two days! It's a beautiful block and will be a beautiful quilt! I always love reading about the changes you make. I love the idea of a day or a few hours to do exactly what one wants to do. I'm trying to spend 30 minutes each day doing something that I want to do. Nice fabric changes for your Memories Of Provence block. Can't wait to see the next one. That's a gorgeous block! I love the center. Can't wait to see more. I love this block ... and the changes you've made make it even more fabulous!!! This quilt will look gorgeous once you've finished it Thelma!! ... And your idea of extending the 'sewing all day' to two days ... my kinda plan, lol!! THat is a gorgeous block, and of course you couldn't resist making a few changes :) Looks like it will be a beautiful quilt and I can't wait to see the finished product. I also like your idea of the "extra day" for treating one's self on Feb 29. But maybe it is better to break up the day into a couple of hours here and there for treats on multiple days. Very pretty block and I love the fabrics! Should have known you would change it up :) Can't wait to see the next block. Looks awesome, Thelma! Thank you so much for blogging about my block of the month! It is so great to see what you are doing with it and the changes you made. I love a block of the month too! I have to many of them sitting around as tops...time to get them quilted. But sewing the blocks is my favorite part. Your Memories of Provence block is lovely. I think the fabric in the middle is absolutely charming. Thanks for sharing and I look forward to seeing this quilt progress! Beautiful block! Excited to see how the rest of the blocks come together!